Bear Albany is bringing back TOGA!...TOGA!...TOGA! 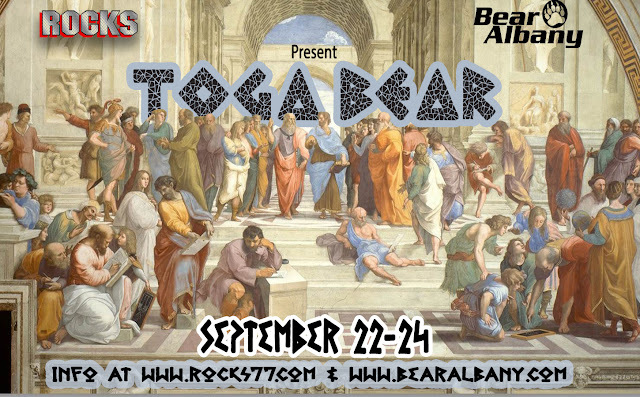 This popular weekend is a great excuse to wear even less to the bar, so break out those extra bed sheets and show Albany how HOT you look in a toga! Join us September 22-24th in Albany’s Capital City. Grab lunch, go shopping for materials to create your Toga or….. Check out the Haunted History Walking Tour in downtown Albany. Lace up your best walking shoes! Brave Guests will be guided along Albany’s downtown streets to unearth the capital city’s storied past. You can also check out the 28th Annual Hudson Mohawk Antique Truck Show at the Saratoga County Fairgrounds in Ballston Spa, NY. Each year, nearly 300 antique trucks are registered at the antique truck show. Feeling lucky? Take a quick trip to the River's Edge Casino! ROCKS’ famous Tea Dance 4p-8p with a Back-Deck BBQ and Mason Jar $4 Long Island Iced Teas all-day/all-night!! Whoever said size doesn’t matter hasn’t had a Tea at ROCKS, so why not stay til Monday? BEAR ALBANY rate is always honored at the host hotel. Water Filtration Filtration Device: After being treated with OZONE, the dead microbes die, their bodies are bonded together to form the suspended sieve in the tank. finished products. So before reaching the finished product point is passed through the ultrafiltration device. Allows the complete removal of these bacteria. Ensure the finished product is of the highest quality.